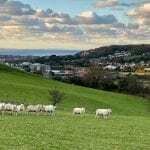 Lamb for the shop during this time of year produced for us, by Colin davies on his farm overlooking the town. 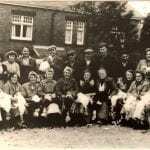 An old photo that came to hand recently of Rob’s late mother and the family, neighbours and friends preparing poultry for Christmas. How things have changed over the years. 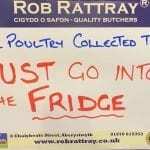 Notice to all customers……….All poultry need to be refridgerated after collection!! The shed, porch, conservatory etc, etc is NOT cool enough! Take good care of your bird until you are ready to cook it! Then enjoy! Beef Cattle from the Royal Welsh Winter Fair maturing for Christmas. 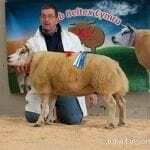 Choice of the best beef produced in Wales will be on offer at our shop for Christmas. Pre-order in advance. 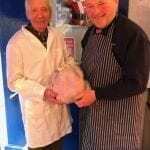 Royal Welsh Show’s Champion Single Pig, produced by our weekly suppliers, Brinley and Carwyn Davies, Penlan and Champion Pair Pigs, produced by local breeder Myrddin James, Llangeitho, bought by Rob Rattray and now being prepared for our customers for Christmas. What do you think of this bird Joe? 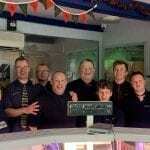 Friendly banter between staff and customer keeps everyone happy! Both Paul and Joe seem impressed with this bird! 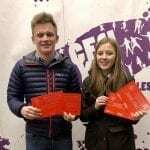 Super proud of both Steffan and Elin on your success at the Royal Welsh Winter Fair this week, both winning their respective age groups in the YFC Lamb Carcasse Stockjudging competitions. Well done both!